Looks like Isaiah Thomas has a home… at least for one season. The former All-Star and MVP candidate signed with the Denver Nuggets on Thursday night for $2 million. 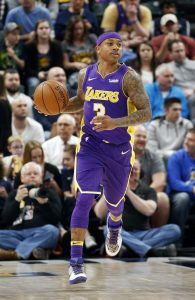 Thomas, who played for the Cleveland Cavaliers and the Los Angeles Lakers last season, hopes to jumpstart his career with the Nuggets and appears to be a good move for both parties. Thomas, who’s rehabbing from minor hip surgery he had in April, needed a home that would utilize his skills properly and give him a chance to work his way back into a star-player. He may have found that home in Denver where they are coached by Michael Malone, who was Thomas’ coach in Sacramento. For Denver, they get a great deal on a player who has proven he can score and score in bunches at the highest level. The road has been a windy and curvy one for Thomas since he was drafted by the Sacramento Kings in 2011. After numerous stops in the league that included stints with the Phoenix Suns and Boston Celtics, it appeared Thomas had finally cemented his place in a lineup in Boston after the 2016-2017 season. After finishing the year as an All-NBA second team pick where he averaged nearly 29 points a game, the trade bug bit Thomas once again and Boston shipped him to Cleveland in the Kyrie Irving deal. It appeared Thomas was on his way to a $100 million contract, only to find himself in a new home and unable to find his rhythm after hip surgery and a long rehab in Cleveland. Now he’s playing for the veteran’s minimum. Denver may be a great spot for Thomas, who will be coming off the bench behind Jamal Murray. With Murray being the only other point guard on the roster, Thomas will be getting the big minutes he’ll need to showcase to teams that he can still play at the highest level and potential earn a long-term contract.